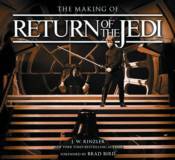 The Making of Star Wars: Return of the Jedi is a lavish fully illustrated book that will be a must-have for fans of the Star Wars movies and lovers of cinema in general. J. W. Rinzler uses his unprecedented access to the Lucasfilm Archives and its trove of never-before-published photos, design sketches, paintings, production notes, factoids, anecdotes, and script drafts to take the reader from concept art and creature design to on-set photography and ILM's visual effects work. This third behind-the-scenes adventure is as entertaining and enthralling as his previous two books, and the movie itself.